Part 1: An Ancient Greek Computer? Among the treasures of the Greek National Archaeological Museum in Athens are the remains of the most complex scientific object that has been preserved from antiquity. Corroded and crumbling from 2,000 years under the sea, its dials, gear wheels and inscribed plates present the historian with a tantalizing problem. Because of them we may have to revise many of our estimates of Greek science. By studying them we may find vital clues to the true origins of that high scientific technology which hitherto has seemed peculiar to our modern civilization, setting it apart from all cultures of the past. From the evidence of the fragments one can get a good idea of the appearance of the original object. Consisting of a box with dials on the outside and a very complex assembly of gear wheels mounted within, it must have resembled a well- made 18ih-century clock. Doors hinged to the box served to protect the dials, and on all available surfaces of box, doors and dials there were long Greek inscriptions describing the operation and construction of the instrument. At least 20 gear wheels of the mechanism have been preserved, including a very sophisticated assembly of gears that were mounted eccentrically on a turntable and probably functioned as a sort of epicyclic or differential, gear-system. Nothing like this instrument is preserved elsewhere. Nothing comparable to it is known. from any ancient scientific text or literary allusion. On the contrary, from all that we know of science and technology in the Hellenistic Age we should have felt that such a device could not exist. Some historians have suggested that the Greeks were not interested in experiment because of a contempt-perhaps induced by the existence of the institution of slavery-for manual labor. On the other hand it has long been recognized that in abstract mathematics and in mathematical astronomy they were no beginners but rather "fellows of another college" who reached great heights of sophistication. Many of the Greek scientific devices known to us from written descriptions show much mathematical ingenuity, but in all cases the purely mechanical part of the design seems relatively crude. Gearing was clearly known to the Greeks, but it was used only in relatively simple applications. They employed pairs of gears to change angular speed or mechanical ad- vantage, or to apply power through a right angle, as in the water-driven mill. Even the most complex mechanical devices described by the ancient writers Hero of Alexandria and Vitruvius contained only simple gearing. For example, the taximeter used by the Greeks to measure the distance travelled by the wheels of a carriage employed only pairs of gears (or gears and worms) to achieve the necessary ratio of movement. It could be argued that if the Greeks knew the principle of gearing, they should have had no difficulty in constructing mechanisms as complex as epicyclic gears. We now know from the fragments in the National Museum that the Greeks did make such mechanisms, but the knowledge is so unexpected that some scholars at first thought that the fragments must belong to some more modern device. Can we in fact be sure that the device is ancient? If we can, what was its purpose? 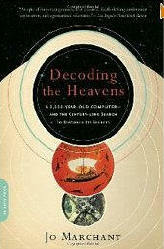 What can it tell us of the ancient world and of the evolution of modern science? To authenticate the dating of the fragments We must. tell the story of their discovery, which involves the first (though inadvertent) adventure in underwater archaeology. Just before Easter in 1900 a party of Dodecanese sponge-divers were driven by storm to anchor near the tiny southern Greek island of Antikythera (the accent is on the "kyth," pronounced to rhyme with pith). There, at a depth of some 200 feet, they found the wreck of an ancient ship. With the help of Greek archaeologists the wreck was explored; several fine bronze and marble statues and other objects were recovered. The finds created great excitement, but the difficulties of diving without heavy equipment were immense, and in September, 1901, the "dig' was abandoned. Eight months later Valerios StaÎs, an archaeologist at the National Museum, was examining some calcified lumps of corroded bronze that had been set aside as possible pieces of broken statuary. Suddenly he recognized among them the fragments of a mechanism. It is now accepted that the wreck occurred during the first century B.C. Gladys Weinberg of Athens has been kind enough to report to me the results of several recent archaeological examinations of the amphorae, pottery and minor objects from the ship. It appears from her report that one might reason-ably date the wreck more closely as 65 B.C. ±15 years. Furthermore, since the identifiable objects come from Rhodes and Cos, it seems that the ship may have. been voyaging from these islands to Rome, perhaps without calling at the Greek mainland. The fragment that first caught the eye of StaÎs was one of the corroded, inscribed plates that is an integral part of the Antikythera mechanism, as the device later came to be called. StaÎs saw immediately that the inscription was ancient. In the opinion of the epigrapher Benjamin Dean Meritt, the forms of the letters are those of the 'first century B.C. ; they could hardly be older than 100 B.C. nor younger than the time of Christ. The dating is supported by the content of the inscriptions. The words used and their astronomical sense are all of this period. For example, the most extensive and complete piece of inscription is part of a parapegma (astronomical calendar) similar to that written by one Geminos, who is thought to have lived in Rhodes about 77 B.C. We may thus be reasonably sure that the mechanism did not find its way into the wreck at some later period. Furthermore, it cannot have been very old when it was taken aboard the ship as booty or merchandise. As soon as the fragments had been discovered they were examined by every available archaeologist; so began the long and difficult process of identifying the mechanism and determining its function. Some things were clear from the beginning. The unique importance of the object was obvious, and the gearing was impressively complex. From the inscriptions and the dials the mechanism was correctly identified as an astronomical device. The first conjecture was that it was some kind of navigating instrument – perhaps an astrolabe (a sort of circular star-finder map also used for simple observations). Some thought that it might be a small planetarium of the kind that Archirnedes is said to have made. Unfortunately the fragments were covered by a thick curtain of calcified material and corrosion products, and these concealed so much detail that no one could be sure of his conjectures or reconstructions. There was nothing to do but wait for the slow and delicate work of the Museum technicians in cleaning away this curtain. Meantime, as the work proceeded, several scholars published accounts of all that was visible, and through their labors a general picture of the mechanism began to emerge. On the basis of new photographs made for me by the Museum in 1955 I realized that the work of cleaning had reached a point where it might at last be possible to take the work of identification to a new level. Last summer, wilt the assistance of a grant from the American Philosophical Society, I was able to visit Athens and make a minute examination of the fragments. By good fortune George Stamires, a Greek epigrapher, was there at the same time; he was able to give me invaluable help by deciphering and transcribing much more of the inscriptions than had been read before. We are now in the position of being able to "join" the fragments and to see how they fitted together in the original machine and when they were brought up from the sea [see illustration]. The success of this work has been most significant, for previously it had been supposed that the various dials and plates had been badly squashed together and distorted. It now appears that most of the pieces are very nearly in their original places, and that we have a much larger fraction of the complete device than had been thought. This work also provides a clue to the puzzle of why the fragments lay unrecognized until StaÎs saw them. When they were found, the fragments were probably held together in their original positions by the remains of the wooden frame of the case. In the Museum the waterlogged wood dried and shriveled. The fragments then fell apart, revealing the interior of the mechanism, with its gears and inscribed plates. As a result of the new examinations we shall in due course be able to publish a technical account of the fragments and of the construction of the instrument. In the meantime we can tentatively summarize some of these results and show how they help to answer the question. What is it? There are four ways of getting at the answer First, if we knew the details of the mechanism, we should know what it did. Second, if we could read the dials, we could tell what they showed. Third, if we could understand the inscriptions, they might tell us about the mechanism. Fourth, if we knew of any similar mechanism, analogies might be helpful. All these approaches must be used, for none of them is complete. The geared wheels within the mechanism were mounted on a bronze plate. On one side of the plate we can trace all the gear wheels of the assembly and can determine, at least approximately, how many teeth each had and how they meshed together. On the other side we can do nearly as well, but we still lack vital links that would provide a complete picture of the gearing. The general pattern of the mechanism is nonetheless quite clear. An input was provided by an axle that came through the side of the casing and turned a crown-gear wheel. This moved a big, four-spoked driving-wheel that was connected with two trains of gears that respectively led up and down the plate and were connected by axles to gears on the other side of the plate. On that side the gear-trains continued, leading through an epicyclic turntable and coming eventually to a set of shafts that turned the dial pointers. When the input axle was turned, the pointers all moved at various speeds around their dials. Certain structural features of the mechanism deserve special attention. All the metal parts of the machine seem to have been cut from a single sheet of low-tin bronze about two millimeters thick; no parts were cast or made of another metal. There are indications that the maker may have used a sheet made much earlier–uniform metal plate of good quality was probably rare and expensive. All the gear wheels have been made with teeth of just the same angle (60 degrees) and size, so that any wheel could mesh with any other. There are signs that the machine was repaired at least twice; a spoke of the driving wheel has been mended, and a broken tooth in a small wheel has been replaced. This indicates that the machine actually worked. The casing was provided with three dials, one at the front and two at the back. The fragments of all of them are still covered with pieces of the doors of the casing and with other debris. Very little can be read on the dials, but there is hope that they can be cleaned sufficiently to provide information that might be decisive. The front dial is just clean enough to say exactly what it did. It has two scales, one of which is fixed and displays the names of the signs of the zodiac; the other is on a movable slip ring and shows the months of the year. Both scales are carefully marked off in degrees. The front dial fitted exactly over the main driving-wheel, which seems to have turned the pointer by means of an eccentric drum-assembly. Clearly this dial showed the annual motion of the sun in the zodiac. By means of key letters inscribed on the zodiac scale, corresponding to other letters on the parapegma calendar plate, it also showed the main risings and settings of bright stars and constellations throughout the year. The back dials are more complex and less legible. The lower one had three slip rings; the upper, four. Each had a little subsidiary dial resembling the "seconds" dial of a watch. Each of the large dials is inscribed with lines about every six degrees, and between the lines there are letters and numbers. On the lower dial the letters and numbers seem to record "moon, so many hours; sun, so many hours"; we therefore suggest that this scale indicates the main lunar phenomena of phases and times of rising and setting. On the upper dial the inscriptions are much more crowded and might well present information on the risings and settings, stations and retrogradations of the planets known to the Greeks (Mercury, Venus, Mars, Jupiter and Saturn). Some of the technical details of the dials are especially interesting. The front dial provides the only known extensive specimen from antiquity of a scientifically graduated instrument. When we measure the accuracy of the graduations under the microscope, we find that their average error over the visible 45 degrees is about a quarter of a degree. The way in which the error varies suggests that the arc was first geometrically divided and then subdivided by eye only. Even more important, this dial may give a means of dating the instrument astronomically. The slip ring is necessary because the old Egyptian calendar, having no leap years, fell into error by 1/4 day every year; the month scale thus had to be adjusted by this amount. As they are preserved the two scales of the dial are out of phase by 13½ degrees. Standard tables show that this amount could only occur in the year 80 B.C. and (because we do not know the month) at all years just 120 years (i.e., 30 days divided by 1/4 day per year) before or after that date. Alternative dates are archaeologically unlikely: 200 B.C. is too early; 40 A.D. is too late. Hence, if the slip ring has not moved from its last position, it was set in. 80 B.C. Furthermore, if we are right in supposing that a fiducial mark near the month scale was put there originally to provide a means of setting that scale in case of accidental movement, we can tell more. This mark is exactly 1/2 degree away from the present position of the scale, and this implies that the mark was made two years before the setting. Thus, although the evidence is by no means conclusive, we are led to suggest that the instrument was made about 82 B.C., used for two years (just long enough for the repairs to have been needed) and then taken onto the ship within the next 30 years. The fragments show that the original instrument carried at least four large areas of inscription: outside the front door, inside the back door, on the plate between the two back dials and on the parapegma plates near the front dial. As I have noted, there are also inscriptions around all the dials, and furthermore each part and hole would seem to have had identifying letters so that the pieces could be put together in the correct order and position. The main inscriptions are in a sorry state and only short snatches of them can be read. To provide an idea of their condition it need only be said that in some cases a plate has completely disappeared, leaving behind an impression of its letters, standing up in a mirror image, in relief on the soft corrosion products on the plate below. It is remarkable that such inscriptions can be read at all. But even from the evidence of a few complete words one can get an idea of the subject matter. The sun is mentioned several times, and the planet Venus once; terms are used that refer to the stations and retrogradations of planets; the ecliptic is named. Pointers, apparently those of the dials, are mentioned. A line of one inscription signfficantly records "76 years, 19 years." This refers to the well-known Calippic cycle of 76 years, which is four times the Metonic cycle of 19 years, or 235 synodic (lunar) months. The next line includes the number "223," which refers to the eclipse cycle of 223 lunar months. The Antikythera mechanism must therefore be an arithmetical counterpart of the much more familiar geometrical models of the solar system which were known to Plato and Archimedes and evolved into the orrery and the planetarium. The mechanism is like. a great astronomical clock without an escapement, or like a modern analogue computer which uses mechanical parts to save tedious calculation. It is a pity that we have no way of knowing whether the device was turned automatically or by hand. It might have been held in the hand and turned by a wheel at the side so that it would operate as a computer, possibly for astrological use. I feel it is more likely that it was permanently mounted, perhaps set in a statue, and displayed as an exhibition piece. In that case it might well have been turned by the power from a water clock or some other device. Perhaps it is just such a wondrous device that was mounted inside the famous Tower of Winds in Athens. It is certainly very similar to the great astronomical cathedral clocks that were built all over Europe during the Renaissance. 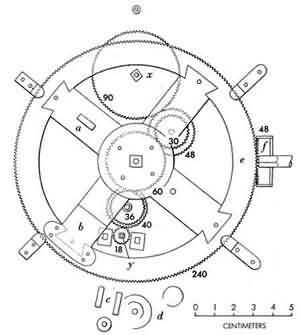 It is to the prehistory of the mechanical I clock that we must look for important analogies the Antikythera mechanism and for an assessment of its significance. Unlike other mechanical devices, the clock did not evolve from the simple to the complex. The oldest clocks of which we are well informed were the most complicated. All the evidence points to the fact that the clock started as an astronomical showpiece that happened also to indicate the time. Gradually the timekeeping functions became more important and the device that showed the marvelous clockwork of the heavens became subsidiary. Behind the astronomical clocks of the 14th century there stretches an unbroken sequence of mechanical models of astronomical theory. 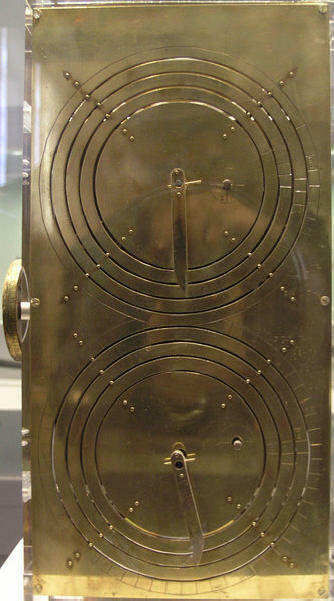 At the head of this sequence is the Antikythera mechanism. Following it are instruments and clocklike computers known from Islam, from China and India and from the European Middle Ages. The importance of this line is very great, because it was the tradition of clock- making that preserved most of man's skill in scientific fine mechanics. During the Renaissance the scientific instrument-makers evolved from the clockmakers. Thus the Antikythera mechanism is, in a way, the venerable progenitor of all our present plethora of scientific hardware. A significant passage in this story has to do with the astronomical computers of Islam. Preserved complete at the Museum of History of Science at Oxford is a 13th-century Islamic geared calendar-computer that has various periods built into it, so that it shows on dials the various cycles of the sun and moon. This design can be traced back, with slightly different periods but a similar arrangement of gears, to a manuscript written by the astronomer al-Biruni about 1000 A.D. Such instruments am much simpler than the Antikythera mechanism, but they show so many points of agreement in technical detail that it seems clear they came from a common tradition. The same 60-degree gear teeth are used; wheels are mounted on square-shanked axles; the geometrical layout of the gear assembly appears comparable. It was just at this time that Islam was drawing on Greek knowledge and rediscovering ancient Greek texts. It seems likely that the Antikythera tradition was part of a large corpus of knowledge that has since been lost to us but was known to the Arabs. It was developed and transmitted by them to medieval Europe, where it .became the foundation for the whole range of subsequent invention in the field of clockwork. On the one hand the Islamic devices knit the whole story together, and demonstrate that it is through ancestry and not mere coincidence that the Antikythera mechanism resembles a modern clock. On the other hand they show that the Antikythera mechanism was no flash in the pan but was a part of an important current in Hellenistic civilization. History has contrived to keep that current dark to us, and only the accidental underwater preservation of fragments that would otherwise have crumbled to dust has now brought it to light. It is a bit frightening to know that just before the fall of their great civilization the ancient Greeks had come so close to our age, not only in their thought, but also in their scientific technology. Rebuilding of the machine of Anticythère: it is the result of research of the pr. Derek de Solla Price, in collaboration with the National Scientific Research Center Démokritos and the physicist CH Karakalos who carried out the x-ray tomography of the original and the mechanism reconstituted to show their operation. Price built a rectangular box of 0.33 X 0.17 X 0.10 m with plates of information and protection, carrying Greek inscriptions of planets. The mechanism is a complex set of 32 gears of various sizes, turning at different speeds. The mechanism was offered by the pr. Price to the national Museum in 1980 and remains the reference for the study of the original despite the fact that its construction has been subject to much criticism. National archaeological museum, Athens, n°BE 109/1980. Source: Copyright © The Economist Newspaper Limited 2002. Starred Review. Marchant, editor of New Science, relates the century-long struggle of competing amateurs and scientists to understand the secrets of a 2000-year-old clock-like mechanism found in 1901 by Greek divers off the coast of Antikythera, a small island near Tunisia. With new research and interviews, Marchant goes behind the scenes of the National Museum in Athens, which zealously guarded the treasure while overlooking its importance; examines the significant contributions of a London Science Museum assistant curator who spent more than 30 years building models of the device; and the 2006 discoveries made by a group of modern researchers using state-of-the-art X-ray. Beneath its ancient, calcified surfaces they found "delicate cogwheels of all sizes" with perfectly formed triangular teeth, astronomical inscriptions "crammed onto every surviving surface," and a 223-tooth manually-operated turntable that guides the device. Variously described as a calendar computer, a planetarium and an eclipse predictor, Marchant gives clear explanations of the questions and topics involved, including Greek astronomy and clockwork mechanisms. For all they've learned, however, the Antikythera mechanism still retains secrets that may reveal unknown connections between modern and ancient technology; this globe-trotting, era-spanning mystery should absorb armchair scientists of all kinds. Copyright © Reed Business Information, a division of Reed Elsevier Inc. All rights reserved. Over the centuries, researchers have found bones and artifacts proving that humans like us have existed for millions of years. Mainstream science, however, has suppressed these facts. Prejudices based on current scientific theory act as a "knowledge filter," giving us a picture of prehistory that is largely incorrect. WHERE DID WE COME FROM? 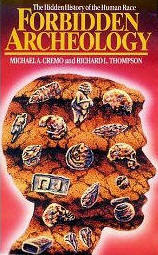 Drawing upon a wealth of research into archeology, genetics, reincarnation memories, out-of-body experiences, parapsychology, cross cultural cosmology, and the search for extraterrestrial intelligence, Cremo provides a refreshing perspective on human origins according to the ancient philosophy of India. In their controversial bestseller Forbidden Archeology, Michael A. Cremo and Richard L. Thompson documented evidence showing that humans have existed on earth for hundreds of millions of years. Such anomalous evidence, contradicting Darwinian evolution, catalyzed a global inquiry: If we did not evolve from apes then where did we come from? Human Devolution is Michael A. Cremo's definitive answer to that question: We did not evolve up from matter; instead we devolved, or came down, from the real of pure consciousness, spirit. Basing his response on modern science and the world's great wisdom traditions, including the Vedic philosophy of ancient India, Cremo proposes that before we ask the question, Where did human beings come from? we should first contemplate, What is a human being? For much of the twentieth century, most scientists assumed that a human being is simply a combination of ordinary physical elements. In Human Devolution, Cremo says it is more reasonable to assume that a human being is a combination of three distinct substances: mind, matter, and consciousness (or spirit). He shows how solid scientific evidence for a subtle mind element and a conscious self that can exist apart from the body have been systematically eliminated from mainstream science by a process of knowledge filtration. Asserting that humans are a combination of matter, mind, and consciousness, Cremo pilots a cosmic tour through incredible enigmas of time and space, ranging from Precambrian microfossils to black holes to superhuman beings, thus revealing the cosmos itself to be divided into corresponding regions dominated by ordinary matter, the subtle mind element, and pure consciousness. Human Devolution illustrates how the self originally exists on the level of pure consciousness, in harmony with the personal source of all conscious beings. When a conscious self relinquishes its connection with the source of all conscious beings, it becomes covered by the lower energies of mind and matter. Cremo calls this devolution. But devolution can be reversed, and consciousness can be restored to its original pure state by a process of spiritual evolution. 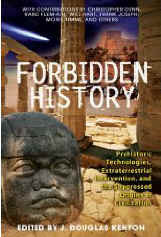 The Controversy Continues: The highly anticipated sequel to the controversial best-seller Forbidden Archeology has arrived. Darwin Debunked by best-selling author of Forbidden Archeology (200,000 copies sold) Thoroughly researched work (includes an extensive 36 page bibliography and 28 page index). For the first time the ancient Vedic or Hindu version of the origins of man are presented. 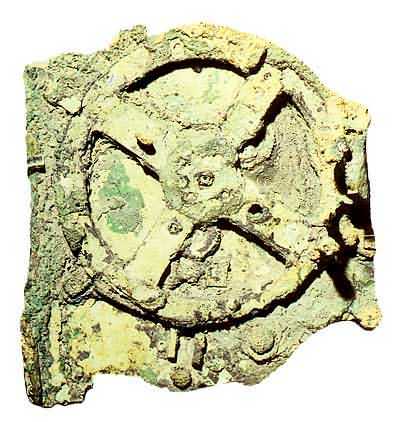 In 1901 divers working off the isle of Antikythera found the remains of a clocklike mechanism 2,000 years old.